Flight Attendants are better positioned than anyone to share our blessings and ideals throughout the world. We play an integral role in bringing families and friends together. We are free to move throughout the world when some can only dream of crossing borders. We carry the spirit of community wherever we go and we are grateful for the chance to interact with all of humanity. Many of us sacrifice our own holiday to ensure the safety and comfort of millions of travelers. Aviation's first responders do this job 365 days a year with professional grace, resilience and bravery. Any challenge we face is no challenge at all when we have a cohesive crew. As President Kennedy encouraged us to live by the words we utter, we are in a unique position to set an example of our “inherited ideals” - and that starts in the way we take care of each other. We are grateful to share a common bond through an intimate understanding of what it means to be a safety professional, a first responder and the last line of defense. We also recognize each other as family. We remain ever vigilant to protect our family. We are grateful and fortunate to have union jobs. We are grateful for the activists who came before us. They fought, struggled, went without, bled and even died for our rights. We continue the work in honor of them and for our children’s future. We are grateful that we have the right to fight for what we believe in and to know that when we stand together with absolute conviction to achieve our goals we accomplish great things. We are especially grateful for our flying partners who serve our country and for all of the service men and women who sacrifice so much to keep us safe. We are grateful for what this holiday represents. By joining together the unique qualities and skills each of us possesses, our community can experience peace and great blessings that spring from our collective hard work and respect for each other. 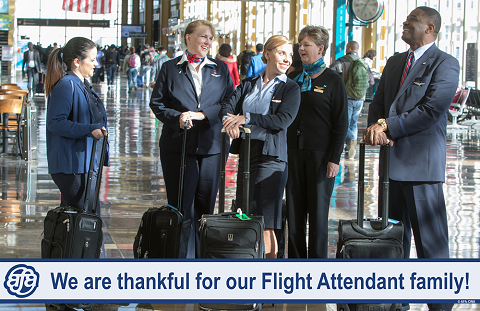 This Thanksgiving, we personally give thanks for each and every one of you, and for the opportunity to lead our great Flight Attendant union into the future. Whether you are flying, celebrating with family and friends, or have other plans, we send warm wishes to you and yours for a safe and a very Happy Thanksgiving!